Extermination camps were killing centers designed to carry out genocide. 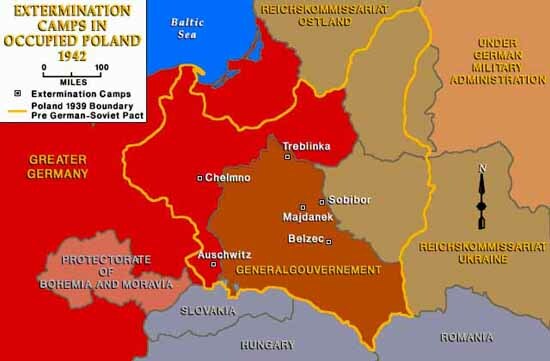 Between 1941 and 1945, the German Nazis established six extermination camps in German-occupied Polish territory - Chelmno, Belzec, Sobibor, Treblinka, Auschwitz-Birkenau and Majdanek. Both Auschwitz and Majdanek functioned as concentration and forced-labor camps as well as killing centers. An estimated 3.5 million Jews were killed in these six extermination camps as part of the "Final Solution." Other victims included Roma (Gypsies) and Soviet prisoners of war.